Royden joined Warwick Plumbing & Heating in 1981 as a purchasing agent, having worked summers prior to that in the warehouse. He was promoted to Vice President and Treasurer in 1985. Upon his father’s retirement in 1989, Royden became President and majority stockholder. He is a graduate from Virginia Tech with a BS in Civil Engineering and holds an MBA from the Tuck School at Dartmouth College. 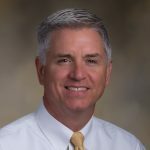 Royden has served on numerous community boards and is currently Vice Chairman of the Riverside Regional Medical Center, The Norfolk Forum Board and the Parks and Facilities Committee of the Mariners’ Museum. Royden is also well known for his philanthropic efforts and is very involved with many charitable organizations, including ORPHANetwork, Virginia Peninsula Foodbank, Riverside Regional Medical Center, The Norfolk Forum and The Mariners’ Museum. Under Royden’s leadership, Warwick employees, vendors and suppliers are major supporters of orphanages and job training programs in Nicaragua.